In both the Global South and The Global North, mining companies are plundering farmlands and forests, polluting water, displacing and exploiting people and their communities. The scarcity- real or manufactured- of metals speeds their extraction. For a few grams of metal, our governments sacrifice our territories, on the altar of productivism. With the promise of employment, a little increase in tax revenues and economic growth, they want to convince us to accept this madness and to believe in clean and responsible mining. But we know that where there is mining, there is misery and desolation. In recognition of this, people who are deciding to defend their homes and reject this fatal system are becoming more and more numerous. NO to mining using toxic chemicals such as cyanide, mercury and sulfuric acid, which seriously contaminate drinking and agricultural water, air and soil, affecting the health of local communities and whole regions. NO to mega mining that creates hundreds of millions of tonnes of toxic waste that causes contamination that lasts for centuries. NO to the opencast mines that destroy ecosystems, agricultural areas, forests, glaciers, causing incurable diseases, leaving behind lunar landscapes and threatening food sovereignty. NO to underground mines that cause radioactive, toxic and carcinogenic elements to emerge from the earth. NO to the mining industry that kills slowly and forces thousands of peasants off their land, depriving them of water and forcing many of them to become miners themselves. NO to violence, poverty and inequalities that are produced by the infinite sacrifice zones suggested and created by the expansion of mining. NO to the criminalization of protest and NO to the systematic of those brave individuals and communities who dare to say NO to mining. NO to lies of those ‘experts’ who insist on telling us that highly destructive projects can be ‘clean’, ‘green’ and ‘responsible’. NO to the thirst for profit, extreme productivism and unbridled consumerism and the misleading belief there is no alternative. YES to AUTONOMY and HARMONY! We will decide the future of ourselves and our children! In solidarity with all struggles against destructive mining, we invite all people to mobilize in territories threatened by mining projects and call upon all those who are committed to standing in solidary with the victims of mining, here and everywhere. 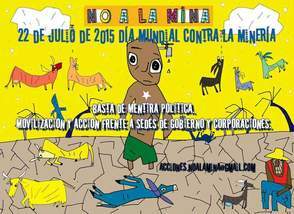 Join us on the 22nd July for the Global Day of Action Against Mega Mining, in defense of life and water. During the last two weeks of July let us manifest, inform and organise resistance processes. Join with other demonstrators around the world. Organise festivals, rallies, symbolic actions, large or small, with 5, 100, or 1,000 or 100,000 people. Unite in front of the institutions and embassies of the countries to which the companies responsible for our struggles belong. Unite in threatened places, on the web, social networks and all media. Through all the means available to us, we will mark our opposition to this deadly industry. Because we can live without mega mining! Because there is no need for this doom! This appeal does not respond to any political banner. The demonstrations are self-managed as a whole. In 2014, more than 25 resistance movements in 20 different countries participated in the Global Day.